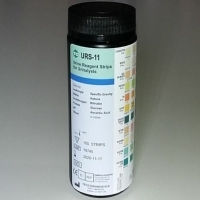 Urine test strips, 11 parameter. For bilirubin check you want low body Vitamin C levels (<25mg/dl) to eliminate false negative results. For checking good biological level of Vitamin C for health, you want to see 50mg/dl or greater. The pad on this strip allows you to do this which eliminates having to have a 2nd Vitamin C test strip or test drops. 2. whether there is adequate vitamin C level in the body.